"Always try and make your training as realistic as possible." As a tactical firearms instructor, I need the best equipment and the best targets. That's what I get with ZMB and Zombie Industries - the best, most realistic targets anywhere. "With their target, it’s clear that they thought things through." You don’t have to be into zombies to appreciate the fun and even realism that can come from using a 3D reactive shot-indicating target like these zombie targets from Zombie Industries. "It’s actually great fun to shoot at this thing! It’s actually bleeding!" I like that the box they ship it in is a target in itself. Shooting at the zombie’s head is just so much better than punching cardboard! These targets can be used a loooong time. And that’s not all! 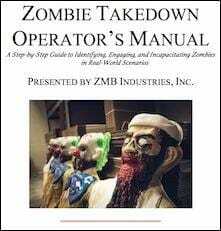 The Zombie Takedown Operator’s Manual also covers key tactical engagement principles and skills like shooting from alternative positions and environmental assessment. With this Operator’s Guide, you'll even discover unorthodox shooting positions like sitting and kneeling. We've even included a list of Zombie Takedown Gear so you can be fully stocked and prepared. This FREE digital PDF guide is yours when you sign up with your email on the right. And be sure to get a few of our Zombie Targets so you can start preparing yourself today! We take your security seriously. We keep your email information confidential and will not share or rent your personal information to any third party.